Oh what fun it is to play with Xyron and Heidi Swapp! The Xyron team is hopping with Heidi Swapp this week and I’ve seen some of the projects already and let me tell you, you’re all in for a real treat! Thanks go out to Heidi Swapp for the collection of wonderful products we received. At first I wasn’t sure what to create, but this little pack of Color Magic Jumbo Pennants just kept calling out to me. I’m in love with buntings/banners recently. I’ve made a slew of different types and still haven’t tired of them. They can brighten up the dullest blank walls, mantles or windows and just put a smile on your face. 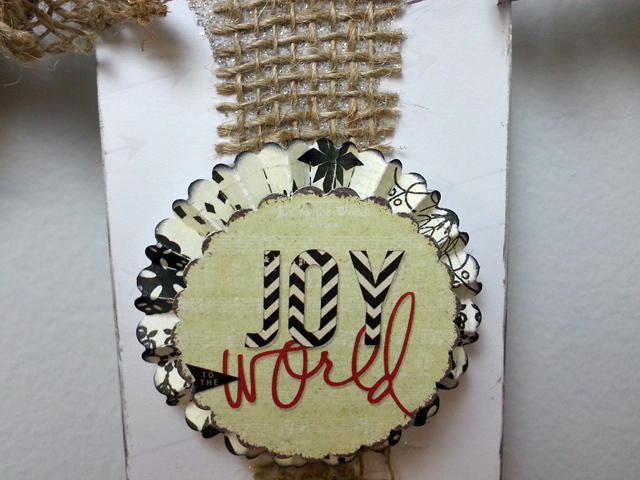 Here’s the steps to create this rustic-style holiday bunting on your own. 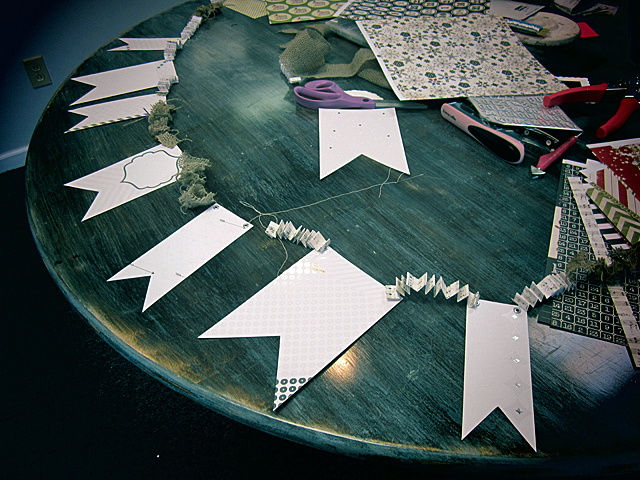 I started with the pennants and attached silver eyelets in each top corner with a Crop-a-dile. Then I edged all the pennants with metallic silver Adirondack Paint Dabber. I wanted to use some of Heidi’s Believe papers and cut eight 3/4-inch strips of the sheet music paper from her Believe 12X12 paper pad. 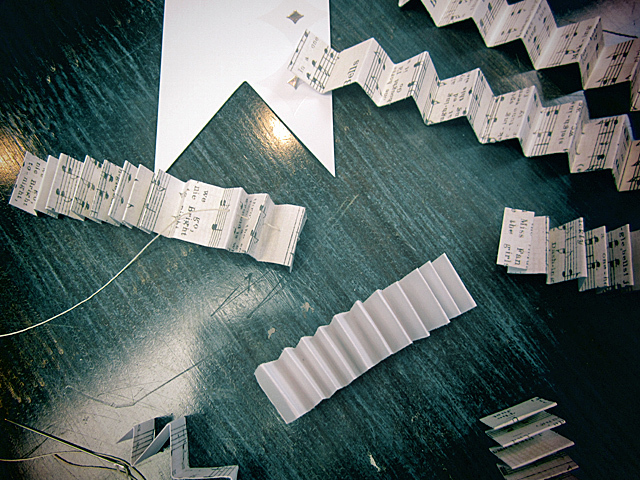 I folded all those into accordion strips – by hand – no scoring tool used (think rustic). I threaded a needle with a good strong thread; I like to use carpet or heavy-duty quilt thread for these type of projects. Then I ran the needle and thread through the center of the strips. The needle actually goes through the paper pretty easily. 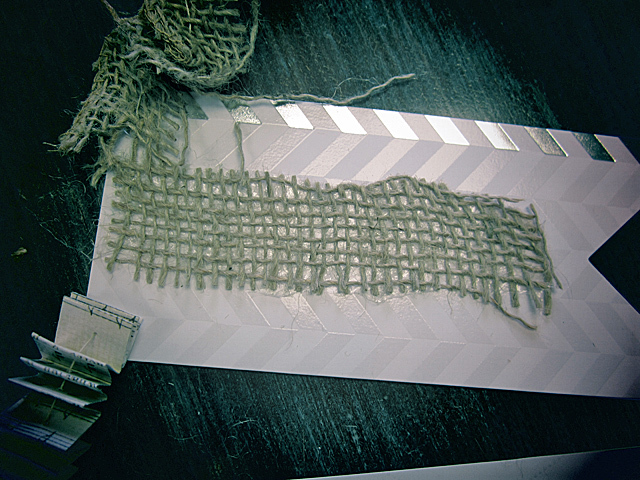 To give it that rustic look I added strips of burlap as well, gathering it through the center with a simple running stitch. All the pieces are connected as we go along so you need to determine in which order every piece will lay. I alternated paper strips with burlap strips in between the pennants. Run the thread behind the pennants so it doesn’t show. The problem I ran into was that it looked so plain so I just went crazy and kept adding bits and pieces here and there – if you can call that a problem! The real problem is knowing when to stop and I didn’t. To add some burlap strips to the front of the smaller pennants I ran them through the Xyron Creatopia with permanent fabric adhesive. Because burlap is an open-weave fabric and the Xryon adhesive gives total coverage, I was able to add some beautiful Antique Silver Fine Glass glitter. I sprinkled over the entire piece of burlap and gently pressed it in before tapping off the excess. 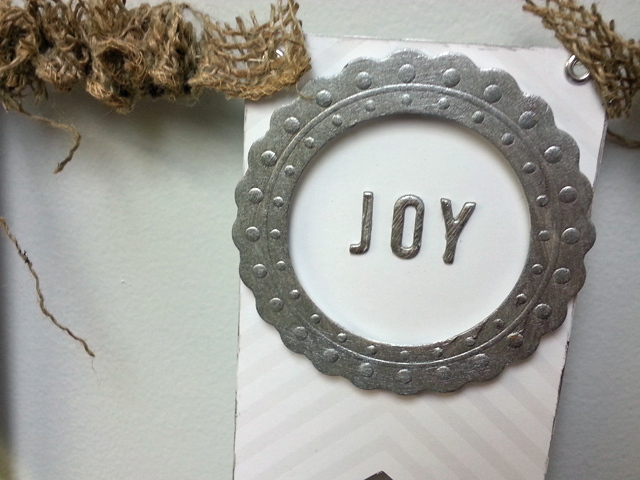 I encircled the word ‘JOY’ with a Heidi Swapp Color Magic Pressed Paper Frame that I painted with the metallic silver Paint Dabber; the Heidi Swapp letters are painted with the same paint. 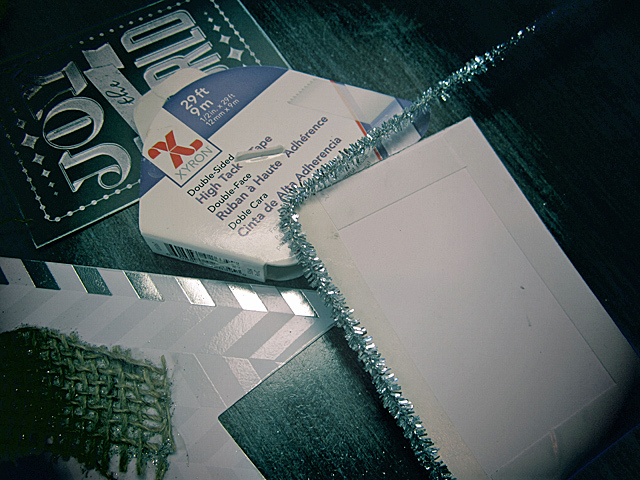 The frame is raised up with the Xyron Black Foam Squares from the Teresa Collins Adhesive Kit. 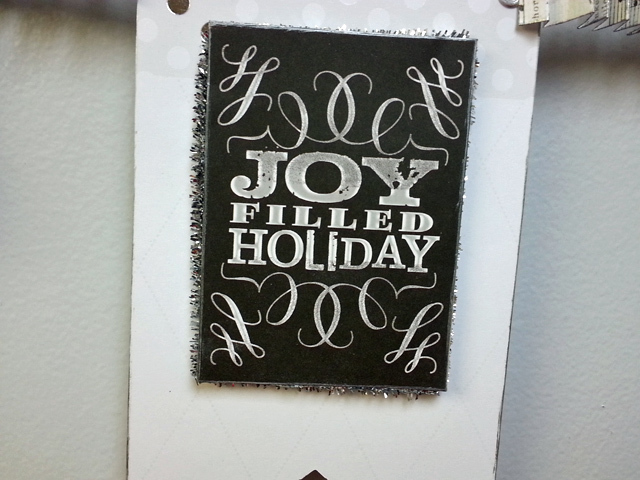 I added two holiday phrases to two of the larger pennant pieces. 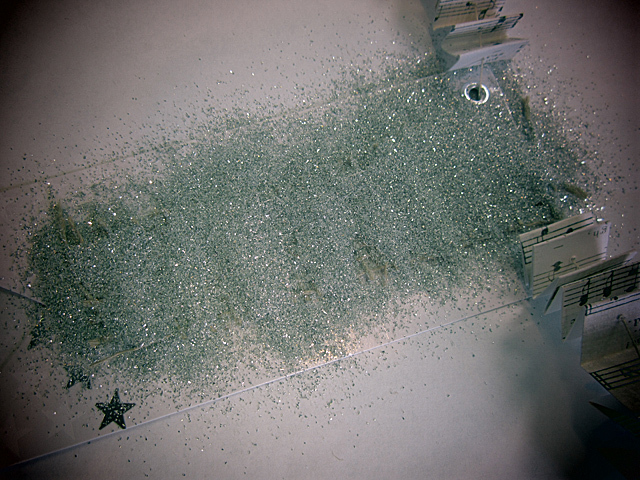 They’re decorated by running the Xyron 1/2-inch Double-Side Tape on all four sides on the backs of these two pieces then pressing in silver tinsel pipe cleaners so they hang just slightly over the edge. These are also popped up with the Xyron Black Foam Squares. I also made several rosettes using the Tim Holtz Sizzix die and topped them with punched circles from another Heidi Swapp paper from the 12X12 paper pad. The punched circle is also raised by the Xyron Black Foam Squares. I lightly inked the edges of the rosettes with Ranger’s Black Archival Ink and the punched circle is edged with the metallic silver Paint Dabber. The rosettes are adhered on top of the glittered burlap strips. This bunting measures around six feet and looks great hanging between two windows in the studio. I love the rustic feel the burlap adds to the white and silver elements. Your bunting is neat. I love all the different techniques and design elements you used on each piece. Such a fun banner. Love your accordion-fold separators! 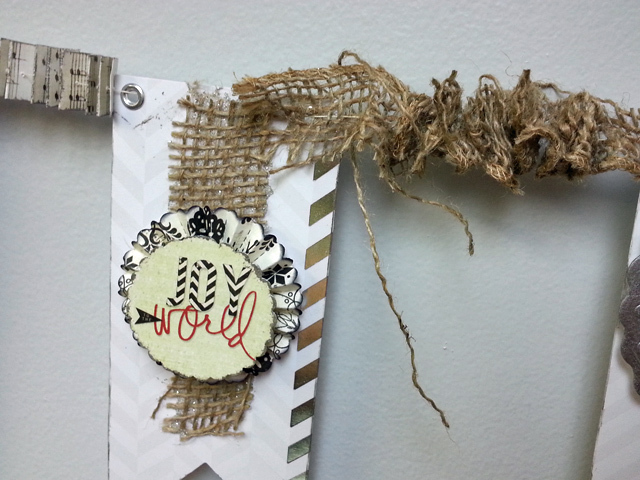 I absolutely love your banner and all the textures and embellishments on it! !